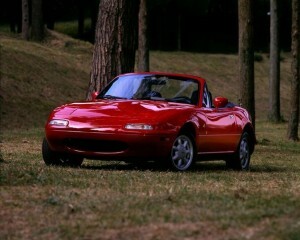 The MX-5 was unveiled at the Chicago Auto Show on February 10, 1989, with a price tag of US$14,000. 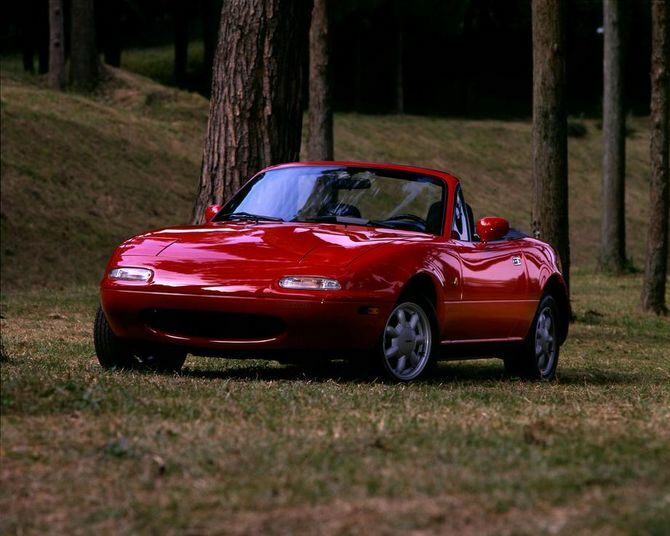 The MX-5, with production code NA, was made available for delivery to buyers worldwide in the following dates: May 1989 (as a 1990 model) in the US and Canada; September 1, 1989 in Japan; and 1990 in Europe. An optional hardtop was made available at the same time, in sheet moulding compound (SMC). Demand initially outstripped production, fueled by enthusiastic press reviews. 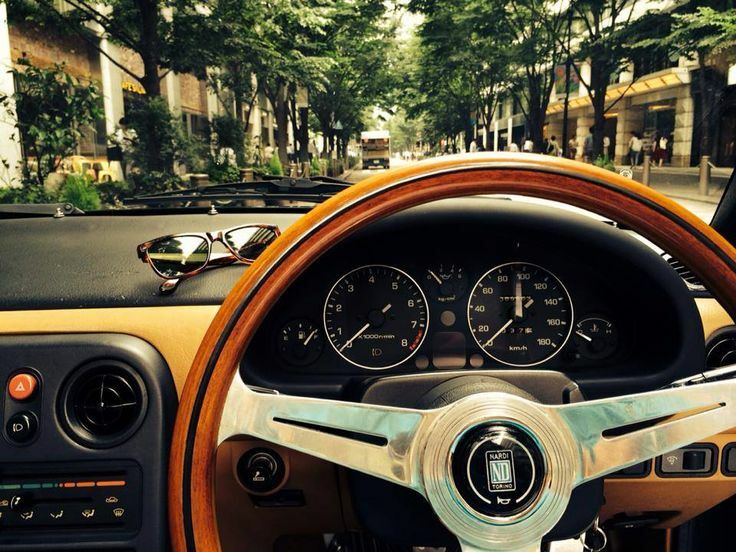 This car is also known as Mazda Miata. The body shell of the NA was all-steel with a light-weight aluminium hood. Overall dimensions were 3,970 mm (156 in) in length, 1,675 mm (65.9 in) in width, and 1,235 mm (48.6 in) in height. Without options, the NA weighed only 2,150 lb (980 kg).Drag coefficient was indicated as 0.38. Suspension was an independent double wishbone on all four wheels, with an anti-roll bar at the front and rear. Four wheel-disc brakes, ventilated at the front, were behind alloy wheels with 185/60HR14 radial tires. The base model came with stamped steel wheels from the then-current 323/Protege. The original MX-5 came with a 1.6L (98 cu in) dual overhead cam inline four-cylinder engine, producing 86 kW (115 bhp) at 6,500 rpm, and 136 N·m (100 lbf·ft) of torque at 5,500 rpm. The engine employs an electronic fuel injection system using a vane-type air flow meter and an electronic ignition system with a camshaft angle sensor instead of adistributor. 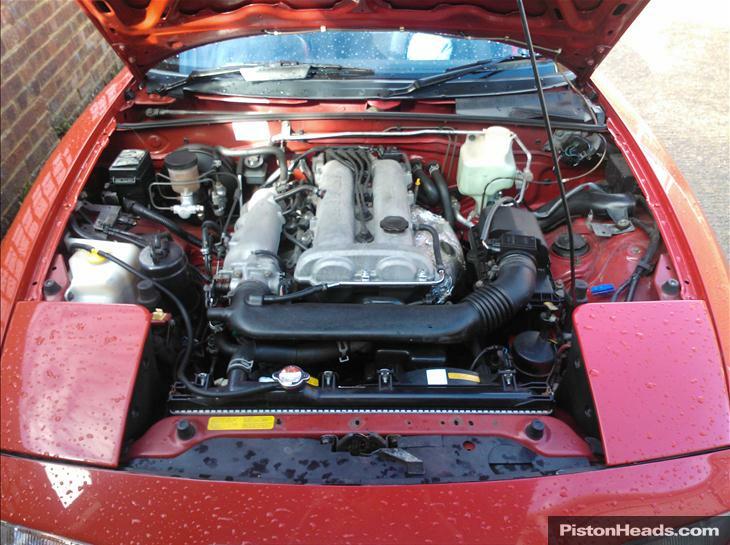 This engine, codename B6ZE(RS), was specifically designed for the MX-5 and featured a lightened crankshaft, flywheel, and aluminum sump with cooling fins. The Pop-Up Head Lights is a unique characteristic of Miata as a classic Japanese Car like Toyota Corolla AE-86. There were a number of trim levels and special editions available, determined by local Mazda marketing departments. In the US, the base model was offered for US$13,995 at launch and was very basic, with manual windows, steel wheels, and without A/C or power steering. The «A Package» offered power steering, a leather-wrapped steering wheel, aluminum alloy wheels and cassette stereo. 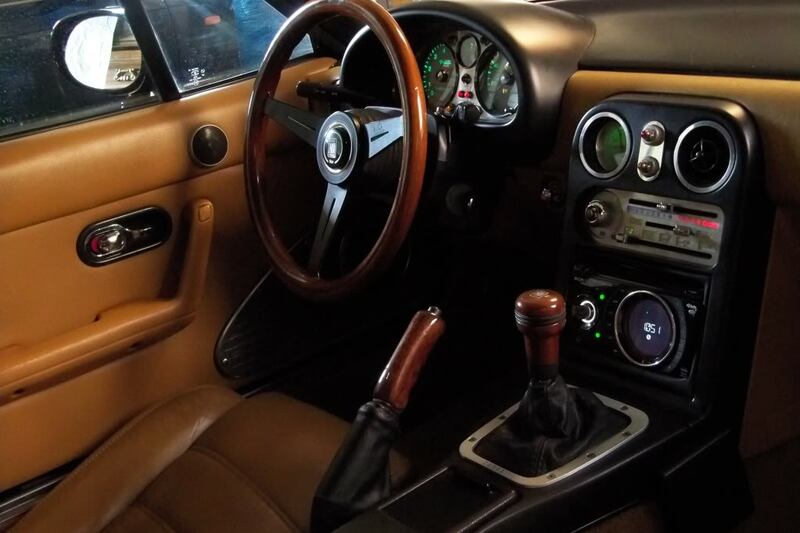 The «B Package» added power windows, along with cruise control and headrest speakers, while the «C Package» included a tan interior and top and leather seats. The «R Package» was for racing, and the annual special editions were formalized as «M Editions». These included all of the luxury options from the «C Package» as well as special paint and, sometimes, special wheels. In the UK, to celebrate Mazda’s 24 hours of Le Mans win, Mazda brought out a special edition of the MX-5, with the winner’s color scheme (see Mazda 787B) and came equipped with BBR (Brodie Brittain Racing) turbo conversion; the car is one of the most sought after special edition cars of the MX-5s.